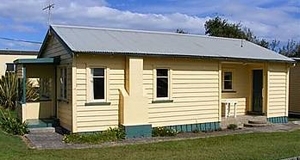 Baylys Beach Holiday Park offers accommodation for every type of traveller. 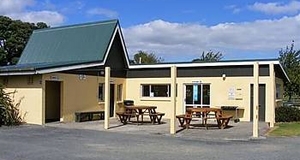 This holiday complex, situated only a short walk from the spectacular long remote sandy beaches of the West Coast of Northland, has freedom quad bike hire on site and the famous Funky Fish Café next door. Take your pick from fully self-contained cottages to budget cabins and flat grassy camp sites set amongst native coastal trees. We have a large communal kitchen, covered BBQ area and outdoor seating, laundry, high-speed internet and play areas for the kids. 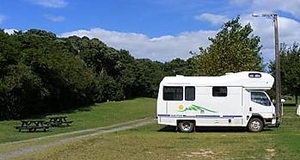 Conveniently located only 5 mins off SH 12 on the Twin Coast Discovery Highway between Dargaville and Waipoua Forest, Baylys Beach Holiday Park is the ideal stop-off point when touring Northland or base for enjoying the delightful Kauri Coast. 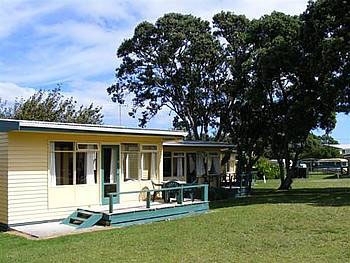 Baylys Beach Holiday Park is a member of the Kiwi Holiday Parks Group. The standard cabins are budget accommodation with beds only. These are ideal for backpackers and budget travellers, groups or families. Linen is available for hire on request. Wireless internet. Campers can choose from a wide range of power and non-power sites around the property. 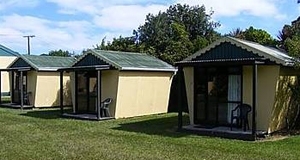 The communal facilities are available for all campers and cabin guests. Extra person: $16 per adult, $8 per child. All these units - linen hire $5 per bed. Our pet rules are: Little dogs are allowed inside as long as they have their own bed, , that they will sleep in, but we prefer the big dogs to be kept outside. All dogs must be kept on a lead at all times and the usual dog etiquette must be kept eg. Cleaning up after them etc. We have pet minders available on request (for a fee). We always like people to make inquiries so that we know what type of dog they have. We do let the dogs all year round but we are aware that maybe some dogs may not like to be in such a crowded camp ground and may be a bit disturbed about it. Therefore please check with us first. Baylys Beach, 14km west of Dargaville, is part of New Zealand's longest beach. The Maori name is Ripiro and the beach is 100km of golden sand, sand dunes and remote (and sometimes wild) coastline. At its southern tip it enters New Zealand's largest harbour, the Kaipara. Activities at Baylys Beach include coastal walks, quad bike riding on the beach, golf, surfing, horse trekking and beach tours by 4-wheel drive bus. 30 mins drive north along SH 12 are the turquoise waters and pure white sands of Kai Iwi Lakes. 45km south, just off SH 12, is Matakohe Kauri Museum - a must-see attraction when you are journeying from Auckland en route to Baylys Beach. The journey from Auckland takes around 2.5 hours. There is a great golf course nearby.